When I was a little girl I always insisted on picking out my outfit in the morning. My Mom never fought me on it but I’m sure there were days where she questioned the taste level of my choices. I think I was so adamant about it because it was my only means of asserting my independence at such a young age. It probably should have been clear indicator that I would grow into a woman with an affinity for fashion. There were no rules. Well, maybe there were, but I was blissfully unaware of them. Polka dots with flowers? OK! Bright purple with neon green? DEFINITELY! The clear winner on too many days to count was a navy and white short and t-shirt set with a large ladybug on it. I think with that set I single-handedly influenced the “critter clothing” trend. All lovers of those pants at Brooks Brothers covered in tiny whales can be thankful to four-year old Jess for being a trailblazer. Despite the fact that the ladybug ensemble probably didn’t see the inside of the washing machine on a consistent enough basis, I never accepted “you can’t wear this” as a reason to not wear something. I didn’t accept it when I was four and I sure as hell am not willing to accept it as a legitimate reason at 30. How much more fun would getting dressed in the morning be if you didn’t feel restricted by society’s established “fashion rules”? Newsflash: you can totally wear whatever you want to wear. 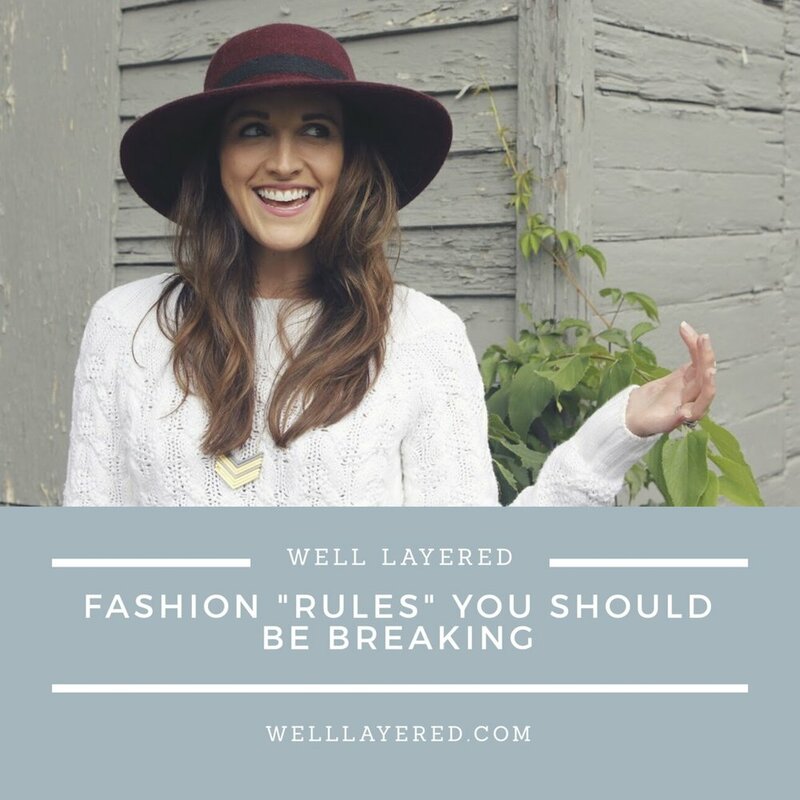 Below are some of the most pervasive style “rules” and how you can take back your personal style, and wear what you want to wear. Rules, as we all know, are always meant to be broken. Parisians will have no clue what I am talking about; they’ve been rocking this color combination forever. I’m not sure what fashion-hater made up this rule. This combination exudes elegance and ease when executed correctly. It’s perfect for a formal event or professional office setting. The key is to ensure that there is adequate variance between the two shades so that it doesn’t appear to be a matching mishap. Let’s get one thing straight: this is just insane. The only time ever to absolutely not wear white is when you are attending a wedding and you are not the bride. The key to wearing white in the fall and winter is to select beautifully luxurious fabrics. Cashmere sweaters, wool jackets, whatever it is, you can surely wear white year-round. Oh, and white denim is always in season. Sweater, Vineyard Vines (past season). PUBLIC SERVICE ANNOUNCEMENT: If you know a man who likes to rock tall white crew socks with pool slides, please take a moment to reassure him that this specific combination is still off limits. I have to be totally honest, even I was skeptical for a while of breaking this “rule”; however, when I came across these beautiful little socks my attitude changed completely, and I think yours might too. This rule will be especially fun to break for all of those holiday parties in the upcoming months! Again, this is surely a rule that I have limited myself to in the past, but just like navy and black, this myth is so completely passé. 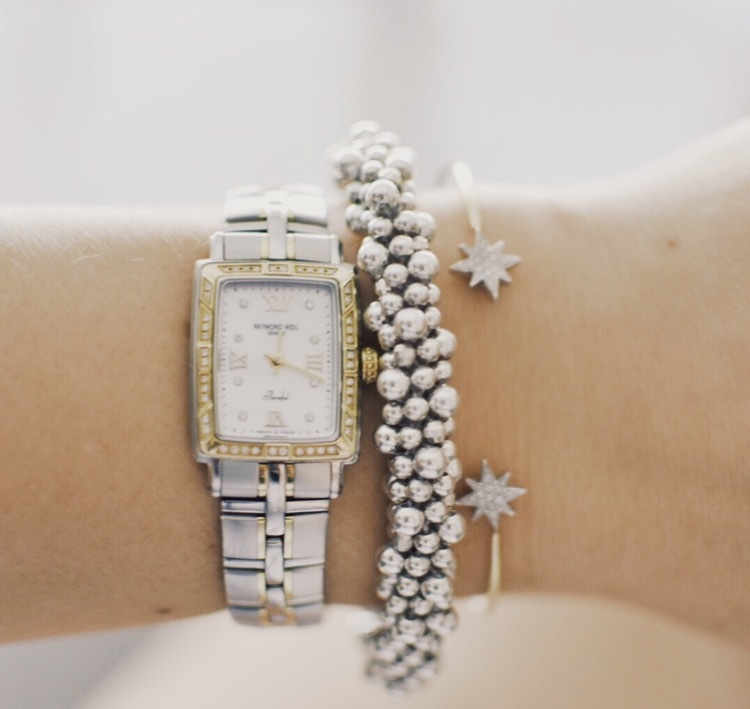 Whether its jewelry, accessories, shoes or the clothes themselves, metallic pieces should be allowed to play nicely together. Heck, both my necklace and my watch combine the two! So, today, let the rebellious side of you show…even just a little bit. If you want to wear your version of the ladybug t-shirt and shorts set, please, by all means, be my guest. Get out there you fashionable rule-breaker, you!